Dem. 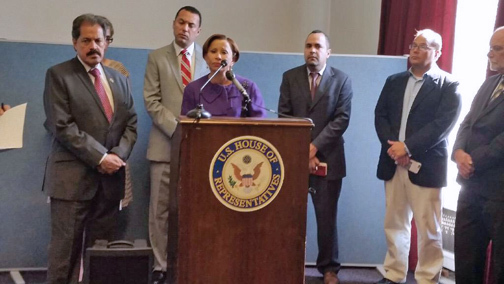 Reps. José Serrano (left) and Nydia Velázquez (at podium) were in the group that appealed to Republican leaders to help Puerto Rico. Congressional leaders José Serrano (left) and Nydia Velázquez (at podium) sent a letter to the Oversight Board lobbying for better spending decisions. Troubled by reports of more than $30 million in expenses after one year of operations, U.S. Reps. José Serrano and Nydia Velázquez sent a letter to the Financial Oversight and Management Board for Puerto Rico expressing concerns over the lack of transparency and independent supervision related to its spending decisions. “At a time when the government of Puerto Rico and its people have had to endure financial sacrifices, it is incumbent upon the Board to do the same and lead by example. As part of that process, the Board must be transparent and accountable by disclosing all of its disbursements,” the lawmakers stated in the letter addressed to Oversight Board Chair José Carrión. In the letter, they pointed to several reforms the Board should look to implement, including the use of Congress’ quarterly “Statement of Disbursements” for expenses incurred by Congressional offices. “In Congress we have a quarterly ‘Statement of Disbursements’ for each expense incurred by a Congressional office. This system — which has been in place for decades — maintains transparency and accountability while at the same time encourages good stewardship of public funds,” Serrano and Velázquez said in their joint letter. “We believe this is a good practice to follow, and to that end, we believe that it is necessary for the Board to provide Congress and the public a detailed account and specific breakdown of all expenses incurred to date,” they said. “This breakdown should detail all salaries, reimbursements, equipment purchases, and contracts incurred by the Board in a detailed, accessible, and comprehensive manner,” they further noted. The members also urged the Board to have a Chief Financial Officer to make sure that the services rendered are obtained at the best price possible; to ensure all contracts are competitively bid; and to agree to undergo an annual audit to ensure independent oversight over these processes. “Furthermore, the Board must make sure that it is a good steward of public funds and — if it has not done so yet — should implement appropriate procedures and practices that maintain the efficiency and effectiveness of the Board,” they said in the letter. “Additionally, the Board must ensure that all contracts are competitively bid, in line with federal contracting standards. Lastly, the Board should be willing to undergo an annual audit to ensure independent oversight over these processes,” the lawmakers said. Implementing policies that make the Board more transparent and accountable will help it maintain support for its mission in Puerto Rico from both the federal government and the people of Puerto Rico, they concluded. Hey Buddy!, I found this information for you: "U.S. lawmakers ask OBoard for transparency in spending". Here is the website link: https://newsismybusiness.com/lawmakers-transparency-spending/. Thank you.